Pediatric physical therapy helps children build strength and increase range of motion, endurance, and coordination. Physical therapy can benefit children with developmental delays, birth defects, or illness. It provides the extra help some children need to achieve milestones such as walking, running, and jumping, or to develop other gross motor skills. 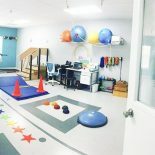 Physical therapists at The Therapy Spot of Baltimore are Maryland Board certified and are here to help your child succeed. Our therapists will create a specialized treatment plan for each child to ensure optimal gains. He or she is showing signs of delayed milestones including: rolling, sitting, crawling, or walking. He or she fatigues easily or shows poor postural control. He or she has had a recent injury or surgery that has restricted strength, mobility or range of motion. He or she has difficulty keeping up with peers on the playground or while playing team sports.